Mr. Polinske took care of a DUI for me. He answered every question I had. He was able to get the DUI changed to another charge, and kept my license. He was wonderful and his assistant was very helpful also. He is the best around. Mr. Polinske is the best lawyer in the metro east area. He is always prompt in responding to questions which is a rare quality in lawyers. He is extremely personable and makes his clients feel at ease. This was my second DUI. Mr. Polinske was successful in having my case dismissed and the charges are expunged from my record. A good lawyer is hard to find. A fantastic lawyer is nearly impossible. Mr. Polinkse is a fantastic lawyer and I would highly recommend him to anyone. I am in Florida and son is in IL. Son had some problems come up and Mr. Polinske was found through the Yellow Pages and Internet search. It was a very difficult experience since I could not be present but Mr. Polinske kept me informed and was so easy to talk to. He and his Secretary were very helpful and considerate through the entire experience and performed a miracle for my son! I can't imagine having any better experience with ANY Attorney even if I were able to be there in person. My son was very pleased and impressed with the results as well. We both highly recommend Mr. Polinske. 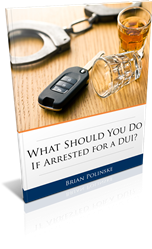 Mr. Polinske helped me with a DUI matter. In fact, I was associated with another "popular local" attorney firm at first and then realized they didn't have the required court experience in aiding my case. At that time, I turned to Brian Polinske and he certainly did have the experience. He was able to help acquit me on my charges. Based on his court experience and ability to be reached when needed, I would highly suggest Polinske and Associates. I have known and retained Mr. Polinske for over 10 years. I would highly recommend him for any legal council. He has always gave good if not excellent results in all matters I have retained him for. He is very professional and creates an excellent relationship between himself and client. This Lawyer is the very best in Madison county ILL.
Mr. Polinske and his office were a pleasure to work with. He is straight forward and great at what he does. I never felt anything other than well represented. Quite honestly I feel extremely lucky to have found Mr. Polinske and would recommend him to anyone looking for a great lawyer you can be confident in. Brian was very helpful in handling my case, was able to get the charges reduced to probation and then later even had the probation closed early. All this was done primarily through email, I didn't have to go to repeated office and/or court visits. Brian made the process as painless as it could be. I would recommend Brian without hesitation. Brian and I never meet face to face, we took care of my citation with emails and phone calls he was very knowledgeable about my citation and inform me that he would and could take of this and he is a man of his word!!!!!!! This was my 1st time of getting a ticket i did know what to think and or say and he told me what would happen and it did. I was photographed by camera speeding in a construction zone. Since I was from out of state and had pending family matters in another, appearing in court was impossible at the appointed date. Mr. Polinske represented me most ably. I am very satisfied with his services. This attorney did a wonderful job representing me in my case He was professional and very helpful he got my felony charge dismissed I will brag and recommend this lawyer until I'm in my grave!!!! I was referred to Brian Polinske by a friend and definitely was not let down. Him and his staff kept me informed of everything that was going on with my case, made me feel at ease and I would recommend this lawyer to anyone! A+++ from me! Outstanding! The thing that I appreciated most about working with Brian Polinske is that he was honest about my case and I was clear from the beginning what to expect. I received regular calls from him to update me on the progress of my suit. He was realistic about our chances and the recent settlement, in my favor, was right within the range of what i was told to expect from the very beginning. I highly recommend Brian Polinske.